New data from San Francisco-based Ward 86 RAPID-ART program. Coffey S, Bacchetti P, Sachdev D, Bacon O, Jones D, Opsina-Norvell C, Torres S, Lynch E, Camp C, Mercer-Slomoff R, Lee S, Christopoulos K, Pilcher C, Hsu L, Jin C, Scheer S, Havlir D, Gandhi M. RAPID ART: High virologic suppression rates with immediate ART initiation in a vulnerable urban clinic population. AIDS. 2018 Dec 21. doi: 10.1097/QAD.0000000000002124. [Epub ahead of print] PubMed PMID: 30585846. 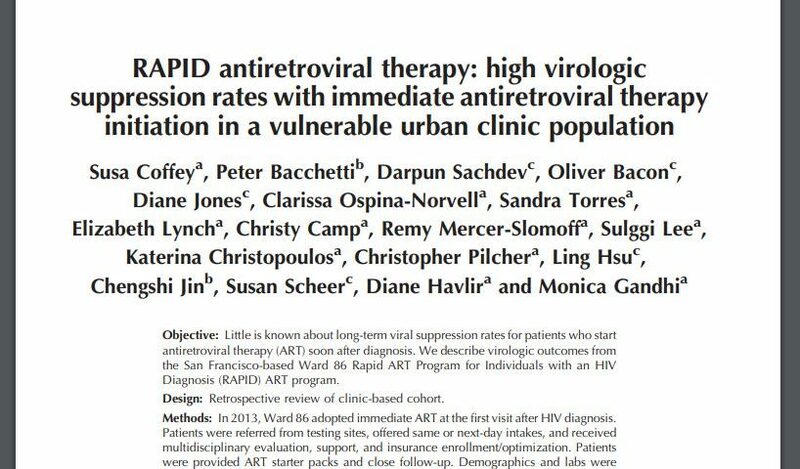 Little is known about long-term viral suppression (VS) rates for patients who start ART soon after diagnosis. 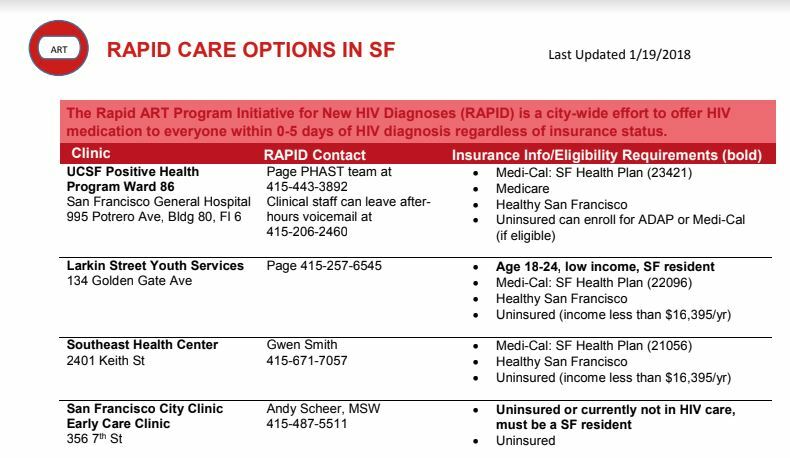 We describe virologic outcomes from the San Francisco-based Ward 86 RAPID-ART program. 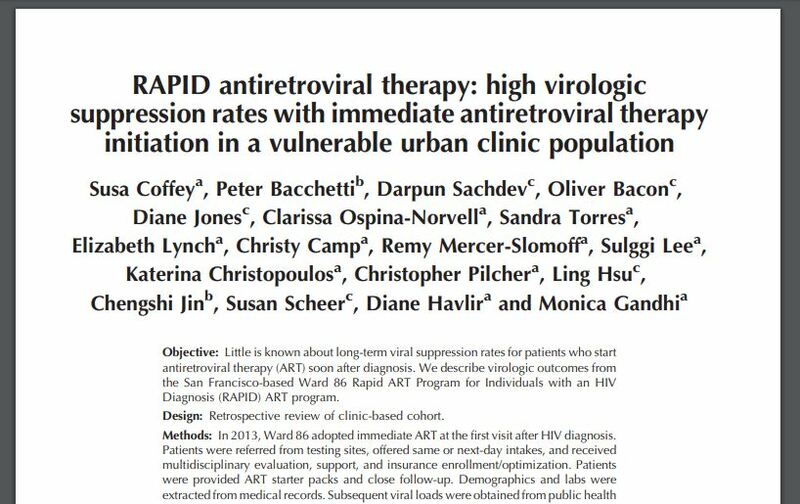 Retrospective review of clinic-based cohort METHODS:: IN 2013, Ward 86 adopted immediate ART at the first visit after HIV diagnosis. Patients were referred from testing sites, offered same-or next-day intakes, and received multidisciplinary evaluation, support, and insurance enrollment/optimization. Patients were provided ART starter packs and close follow-up. Demographics and labs were extracted from medical records. Subsequent viral loads (VLs) were obtained from public health surveillance data. Kaplan-Meier curves summarized distribution of times to 1st VS; VS rates at last VL recorded were calculated. Of 225 patients referred to RAPID-ART from 2013-17, 216 (96%) were started on immediate-ART: median age 30; 7.9% women; 11.6% African-American, 26.9% Hispanic, 36.6% white; 51.4% with substance use; 48.1% with mental health diagnoses; 30.6% unstably housed; baseline median CD4 441; median VL 37,011. By 1 year after intake, 95.8% achieved VS to <200 at least once. Over a median follow-up time of 1.09 years (0-3.92), 14.7% of patients had viral rebound, but most (78%) resuppressed. VS rates were 92.1% at last recorded VL. In an urban clinic with high rates of mental illness, substance use and housing instability, immediate ART provided through a RAPID program resulted in VS at last VL measurement for >90% of patients over a median of 1.09 years. Rapid ART for vulnerable populations is acceptable, feasible, and successful with multidisciplinary care and municipal support.